Description: Tufted perennial to 0.9 m high, with extravaginal innovations. Leaves with sheath glabrous or the margins and collar ciliate; ligule membranous below, ciliate above, c. 1 mm long; blade 3–8 mm wide, antrorsely scabrous or glabrous. Panicle 5–30 cm long; bristle c. 30–50% the length of the terminating spikelet. Spikelets acute, 2.5–2.75 mm long. Lower glume 40–50% as long as the spikelet, shortly acute to obtuse, 3–5-nerved; upper subequalling the spikelet, 5–7-nerved. Lower lemma sterile, equalling the spikelet in size and shape, 5-nerved; palea small or absent. 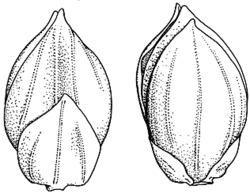 Upper lemma acute, apiculate, as long as the spikelet, striolate throughout and moderately coarsely rugulose about the middle and lower portions. Distribution and occurrence: Grows in creek lines and drainage ways on good soil.